In April 2006, South African Airways joined Star Alliance. Egyptair followed in July 2008 and just a couple weeks ago, Ethiopian was accepted as a future member. Now the three airlines are coming together to look at a joint venture in Western Africa. If this happens, these Star Alliance carriers will cover the African continent like nobody has before. I was so interested in the combined coverage of these airlines in Africa that I went over to the Great Circle Mapper and put their route maps together. I excluded domestic flights within Egypt, Ethiopia, and South African just to avoid too much clutter on the map, but the result is still incredibly impressive. One thing to keep in mind here is just how big Africa actually is. The distance between Egyptair’s Cairo home to Ethiopian’s Addis Ababa base is about the same distance as from Atlanta to Salt Lake City. And then from Addis down to South African’s Johannesburg base is actually just a bit farther than JFK to LAX. This continent is enormous, and the three hubs are well-positioned to cover it already. As you can see, Egyptair serves Europe well from its Cairo base in Northern Africa. After all, its Airbus narrowbody fleet can do that easily. It also has good coverage in the Middle East and in major Asian destinations. Ethiopian has its focus on Central and Eastern Africa with excellent service to the Arabian Peninsula. There are also limited connections to Europe and Asia. Meanwhile, down in Johannesburg, South African covers Southern Africa well but it also operates more of a long haul operation touching the other continents. On a map, this looks like an African powerhouse, but there is one hole. Yes, Ethiopian serves a lot of West Africa but most of those flights are from an East Africa perspective. What’s missing is a way for those people in West Africa to fly between cities in West Africa as well as connect into the broader network. And that’s why the three airlines are coming together to talk about a joint venture to do just that. West Africa has had its share of failed carriers. In fact, I’m hard-pressed to find a single one that’s a sustainable success. Sure there are airlines like Arik Air in Nigeria trying to make a go of things, but it just hasn’t been around very long. The airline has had an aggressive expansion, so I want to see a lot more age on it before declaring it a success. For the most part, West African airports are haunted by the ghosts of failed airlines. So can Ethiopian, Egyptair, and South African finally unite the continent and offer a reliable, solid product throughout? Let’s be blunt. It’s a long shot. There’s a reason that airlines haven’t survived in West Africa, and it’s not all about bad management. It’s a tough political game there, and many have failed to play it well. In fact, with shifting regimes, it’s unclear if it’s even possible to play it well for extended periods of time. But I still like the initiative here, and I certainly welcome the idea of a safe, reliable carrier giving options for travel throughout Africa. While SkyTeam member Kenya Airways also has a solid operation in Nairobi, there just really aren’t many other options for good bases of operations on the continent. Star Alliance really has a huge advantage here, and I can’t see that changing. Cranky, you’re forgetting another African airline with great coverage of West Africa — Royal Air Maroc. Sure, it’s not ideal for inter-African connections, but it’s perfectly placed for connections to Europe and North America, which is why Casablanca airport is always teeming with Africans on long layovers. Hard for an airline in a place where so many people have no food let along the means to fly. Rebels are always causing problems, and unless you have wild animal parks that draw tourists or oil to get those nonstop charters from Houston there is not much reason to travel around Africa for the average person maybe. DL & UA are now on the ground in Africa. DL has a head start, but UA might be better positioned for the future with their *A partners. UA serves just one destination on the continent, but CAI and LOS are coming next year. They would also seem to have an advantage with their IAH and EWR hubs. I’ve been curious if it might make sense for DL to set up a scissor hub in Africa…probably quite a stretch to see that happening, though. Cranky, finally someone is looking at Africa seriously. Middle Africa is the battleground between Kenya Airways (KQ) & Ethiopian (ET). Nairobi & Addis compete with Dubai to serve Central, West & South Africa connecting to Asia especially to China. It seems a new destination is added every month. Nov 2010 will see Nampula in Mozambique served by Kenya Airways from Nairobi. It’s sister (Precision Air) will also fly there from Dar-Es-Salaam in Tanzania. Dec 2010 has a line-up as well. SkyTeam does not have as strong a presence as Star Alliance but for many Europeans & Americans, using the Delta/KLM/AF/KQ connection gets you into most of Sub-Saharan Africa. For ex-USA customers, I think Delta works best to West Africa (onward connections using KQ). Of course, flying via Europe really opens it up with BA, AF, KLM, Swiss, etc flying to various African destinations. I think to get the full picture of Star’s coverage in Africa you cannot leave out the route map of recent addition SN. (In fact I would recommend you draw the graphic again with SN to see the additional coverage for yourself) It serves 18 destinations alone, 14 of which are located in West Africa and are convenient for European/US customers to access. If ET/MS/SA can make a go of a West African airline that will just be icing on the cake. It will be hard for any of the other airline alliances to compete with Star in Africa. Wasn’t Air Algerie going to join Skyteam with the help of Air France? I think Delta is also trying to get TAAG Angola on board. With some effort Skyteam can be a clear #2 in Africa. TAAG has started code-sharing with KQ on NBO-Luanda flights 2x week using 737s. The Angolans are protecting their turf. Took KQ 5 years to get Landing Rights! 2014 World Cup will boost TAAG which can capture significant Africa-Brazil traffic. It’s a bit hard to tell but it looks like the Ethiopian link to IAD is missing. Plus, their frequent flyer program is called “ShebaMiles.” Kick asssss. Nah, it’s there just hiding. You can see it poking out after the Egyptair flight ends in JFK. 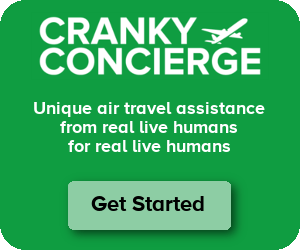 Dear Cranky, I would like to ask your permission to reproduce the map above in my updated version of an old post with digest of aviation news (the post in question is from October 2010) with the credit and hyperlink. Who the F*&@ is Vision Airlines?